Doctor Who is one of the most beloved characters (and one of the most successful franchises) in television history. This November, the world celebrates the 50th anniversary of this British icon. 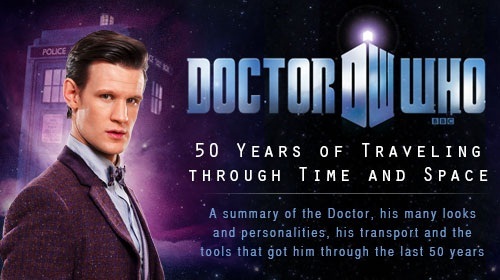 The infographic below will provide you with a summary of all the Doctors over the last 50 years, as well as tidbits about his spacecraft the TARDIS, his gadgets and some Whovian fun facts. Learn something new or simply brush up on the Doctor's history as you prepare for the 50th anniversary special airing later this month. Allons-y! Travis is a videographer, t-shirt aficionado and seasoned costume guru. He also boasts expert knowledge of all things Doctor Who and Lord of the Rings related. He can usually be found drenched in fake blood at a zombie pub crawl, taking brewery tours wearing German lederhosen, or guising as a Jack Sparrow impersonator-- convincing people to buy him a drink of rum.